Affiance are currently on the road with Protest The Hero and have just announced their first tour of South Africa to kick off March 22, 2014! Dates are below. Singer Dennis Tvrdik checked in from the road to say, “We never thought we would have the opportunity to play music overseas, let alone in Africa! Super excited to explore and experience South Africa for the first time.” Tickets are on sale this Wednesday the 27th through www.CompuTicket.com, as well as at CompuTicket outlets and Checkers stores in SA. 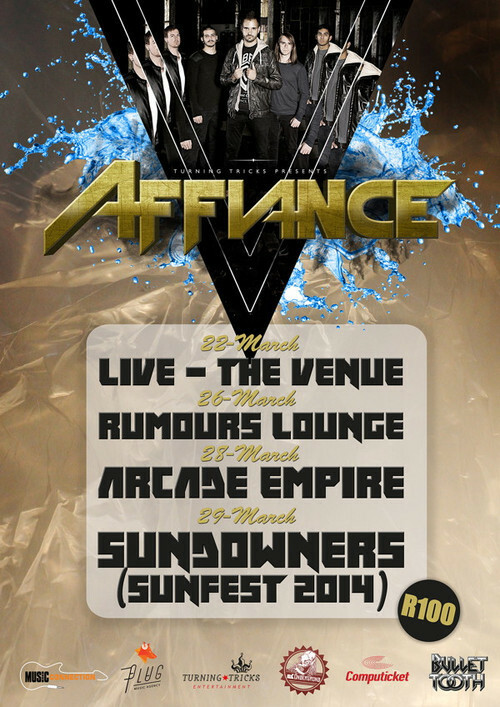 Affiance Live In South Africa is sponsored by MK Ondergrond, Music Connection, and Plug Music.